Listen to Paul's interview on the CATHOLIC CONNECTION with Teresa Tomeo on November 8th - 990 AM - Catholic Radio. 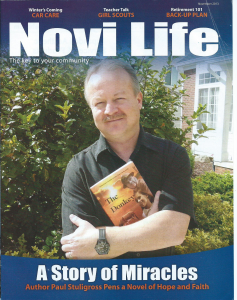 Click HERE to read a review of The Donkey in the November, 2013 edition of Novi Life. Hope and Perspective. It’s something we can all use a little of. I thought about that as I read a bumper sticker that said: “I lift Detroit up in prayer.” I grew up in Detroit. My brother and I attended grade school at Christ the King, played baseball with West Seven and spent our summers running between houses, swimming, and enjoying life. Then I “grew up” and became a police officer in Novi. Nothing like a job like that to change your perspective. I’m thankful for a time when God helped me get it back. After twenty-four years at the police department, working holidays and weekends, I’ve learned to cherish "normal" time off with family and friends. I’ve also learned some valuable lessons being "off" all summer as a teacher. I’d like to share five of them with you. Lesson One: the pros of being off all summer are great. But that doesn’t mean there aren’t cons. Pro: I’m off all summer with my kids. Con: I’m off … all summer … with my kids. As we draw near the end of another school year, I’m reminded of the first graduation I attended as a teacher at St. Mary’s. As I sat amidst my cohorts watching the students process in, I felt a sudden tinge of emotion. As students gave speeches and parents beamed with pride, here I was, sitting with the faculty, welling up. I barely knew these kids; so, what was my problem? Perhaps I recognized – as a parent – how these families felt as they watched their children walk through this ceremonious doorway, into the next phase of their lives. Being both a teacher and parent, I tend to make connections between my own kids and the ones I teach. And I wonder if my kids come across to their teachers as well as my students do to me. The other day I got a glimpse of an answer. As a high school Theology teacher, I am often challenged with different questions from my students. One of the questions often asked is about the existence of Hell. Does it exist? I always feel compelled to answer the question as delicately - albeit truthfully - as possible. As fall sports move into high gear it prompts me to recall my own high school days at my alma mater, Detroit Catholic Central. Now, as a Catholic school Theology teacher I am again immersed in those same fall rivalries. My first year as a teacher – at Orchard Lake Saint Mary’s – reminded me how fun those rivalries could be. As a newer teacher, though, I often wondered how deep these contentions ran. I wondered if the rivalries ever melted into enmity or bitterness. After all, sports have taken a much more prominent role in society today. As much as I love sports, I often questioned whether they had been elevated to too high a level of importance.